To remedy this potential problem, President Obama – with bipartisan support – proposed an extension of the 3.4 percent rate for one year. After a one-year reprieve, interest rate hikes for those in the Stafford loan program are again staring lower and middle class students dead in the face. This time around, however, the only proposed solutions will increase student debt. Let’s assume a student graduates with $10,000 in subsidized Stafford loan debt. If interest rates were to double, that student would pay an extra $2,000 in interest over the life of their 10-year loan. While this scenario may be frightening, the proposed solutions may end up being worse. Considering that current interest rates for unsubsidized Stafford loans are 6.8 percent, Parent PLUS is 7.9 percent and the 10-year Treasury yield is at 1.84 percent, this formula would be a benefit for parents and students at the present moment. But when the economy picks up again, parents and students will most likely be paying more money for interest for all three government loans. In the years leading up to the recession, 10-year interest rates peaked at around 6.6 percent in 2000 and hovered around 4.5 to 5.25 percent in the immediate run-up to the recession. If the economy fully recovers, students will be facing interest rates that may be much higher than current rates. Using the formula quoted above, if 10-year treasury rates were between 4.5 and 5.25 percent, subsidized Stafford loan rates would be between 5.43 and 6.18 percent, unsubsidized Stafford loan rates would be between 7.43 and 8.18 percent, and parent PLUS loans would be between 8.43 and 9.21 percent. If Treasury rates returned to their pre-recession peak, interest rates would be even higher. With the economy still “depressed” and student debt at an all-time high, policymakers and students should be discussing reforms to the way interest rates are calculated. These reforms should focus on long-term affordability and accessibility. Education advocates worry about the government using these loans, which serve lower and middle class families, as means to generate long-term profits. ThinkProgress noted that the federal government is set to make $34 billion off of student loans in 2014, and the government makes 12.5 cents on every subsidized Stafford loan dollar. Nearly two-thirds of those in the Stafford loan program are from families with an annual income under $50,000. 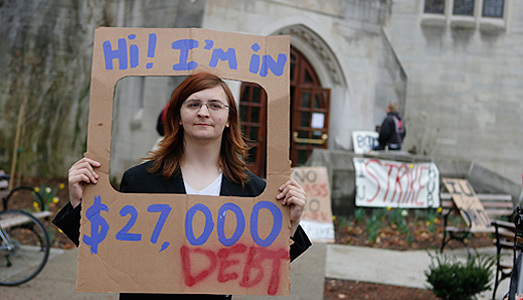 Education advocate Ethan Senack said, “[H]igher education loans are meant to subsidize the cost of higher education, not profit from them, especially at a time when students are facing record debt.” Tying interest rates to market conditions, while possibly providing short-term relief, may be counter to this mission in the long run. Students should demand more lasting, meaningful reform. Sean Kitchen is assistant editor of Raging Chicken Press, a small activist, progressive publication in Kutztown, Pa.
Sean Kitchen is the assistant editor for the Raging Chicken Press, in Pennsylvania. The Raging Chicken Press was created as a response to Gov. Scott Walker's attacks on public sector unions in Wisconsin and Gov. Tom Corbett's "cradle to the grave" destruction of public education in Pennsylvania. Sean is a union activist and environmentalist from Philadelphia, and is involved in grassroots activism with Put People First! 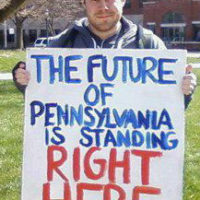 PA and Occupy Philadelphia / Wall Street.